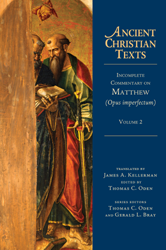 In a fifth century document commonly referred to as Opus imperfectum in Matthaeum, the author makes a number of fascinating remarks concerning Matthew chapter 24. Of particular interest is his repeated reference to Jesus' statements about the destruction of Jerusalem. The author clearly believed that the prophetic statements of Jesus in Matthew 24 involved, in the very least, literal historical fulfillment in the Jewish wars leading up to the destruction of the Temple in 70A.D. But he also imposes a convenient distinction between a "spiritual Jerusalem and a physical Jerusalem," making it possible for many of Jesus' statements to also apply to the "spiritual Jerusalem" (i.e. the Church), which spans the entire course of church history until the final consummation. But he [Jesus] answered them, "You see all those, do you not? Truly, I say to you, there will not be left here one stone upon another, that will not be thrown down." If some city rebelled against its earthly king, does he not remove the rights from that city and send his soldiers to make it desolate so that the city that did not recognize the power of its king in good times can know it in bad times and that its very desolation can attest how previously the good graces of the king had benefited it? But this nation rebelled against me, the heavenly king, ruined my law, scorned my commandments, killed my servants, raised their ungodly hands against me and further plots to kill me unless my immortal nature would defend me. So I will remove the pledge of my truth from it, that is, the Holy Spirit. I will remove my army, that is, my holy angels who protected it, so that here a stone will not stand upon another stone. Therefore, when salvation departs from it, perdition must rule it. As he [Jesus] sat on the Mount of Olives, the disciples came to him privately, saying, "Tell us, when will this be, and what will be the sign of your coming and of the close of the age?" And Jesus answered them, "Take heed that no one leads you astray." [T]he apostles asked... "What is the sign of the destruction of Jerusalem?" ...for at the end of the Jewish nation Jerusalem was destroyed, which seemed to be Jerusalem but really was not. ...[T]he Lord does not say distinctly which signs pertain to the destruction of Jerusalem...[so] the same signs may seem to pertain both the manifestation of the destruction of Jerusalem and to the manifestation of the end of the world... What can we say then? If we wish to fully understand in a spiritual manner these signs of famine, wars, and earthquakes, they cannot pertain to the manifestation of the destruction of Jerusalem because then spiritually a nation did not rise up against nation, that is, a heresy did not rise up against heresy. ...The physical Jerusalem existed, which already has been besieged figuratively, but there is another, spiritual Jerusalem, namely, the church of Christ, which also must be tested to the end of the world and still is being tested. Therefore, just as there are a spiritual Jerusalem and a physical Jerusalem, so also those signs of which the Lord speaks must be understood both in a spiritual sense and in a physical sense. When understood physically, they indicate the destruction of the physical Jerusalem, but when understood spiritually, they indicate the testing of the church at the end to come. Some say that the abomination of desolation was the image of Caesar that Pilate put in the temple. But the Evangelist Luke more accurately interprets what is the desolating sacrilege. For in the place where the current passage of Matthew and Mark write, "But when you see the desolating sacrilege," in that very passage Luke writes, "But when you see Jerusalem surrounded by armies, then know that its desolation has come near." And so he says who are in Judea, namely, in order to show by the other resemblance of the explanation of this passage what is the desolating sacrilege standing in the Holy Place. For there was an army of foreigners and the Roman emperor standing around Jerusalem, which up until then was holy. Peter also explained this in Clement.3 Finally, the text itself also showed that this is the desolating sacrilege. For it is as if he goes back over all those things that he had said earlier and summarized them briefly and says, "So when you see the desolating sacrilege...standing," that is, "When you see those very battles now standing around Jerusalem, which you had previously heard about." ...The Roman army is called the desolating sacrilege because he would make the souls of many Christians desolate of God. For before the Romans captured Jerusalem, for half a week Christ bore by his doctrine the constant sacrifice of the Jews from his midst. For it is said that he taught for three years and six months; that number makes half of seven years, so that that sacrifice that was constantly in use would be removed from their midst and the sacrifice of praise would be offered with their voice and the sacrifice of righteousness in works and the sacrifice of peace through the Eucharist. But up until the end of the age there was an uproar because the Jewish custom of offering sacrifices was never rectified.